The Golden Nugget Hotel and Casino Pool is located in the heart of Downtown Las Vegas and is called H20. It is one of the top ten pools in the world on several lists, and its design with three levels and two pools leaves little to be desired. 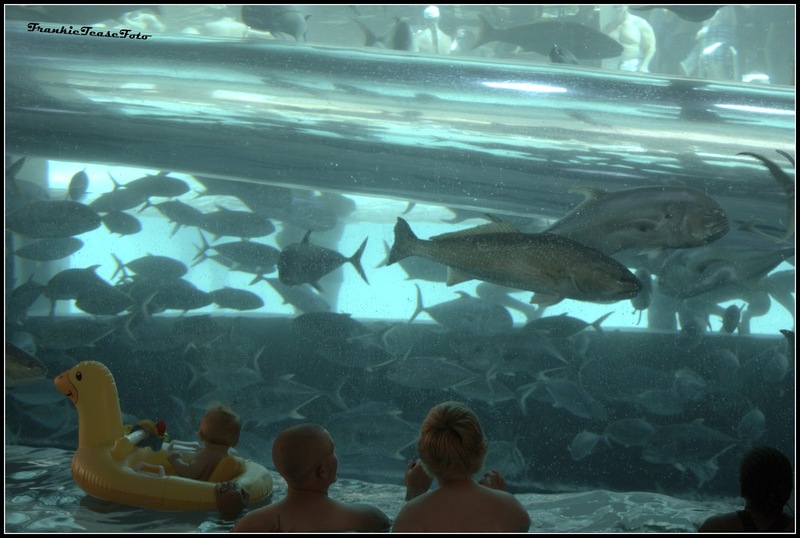 Level one allows you to swim with sharks in the shallow end (they're behind glass) or climb to the third deck to slide through the shark tank in a tube. While on the third floor, pay a little more to enter the adult pool area, no kids allowed. This luxurious rooftop pool area has day beds, cabanas, a bar, and very unique see-through wading pool for those relaxing, drinking and partying. 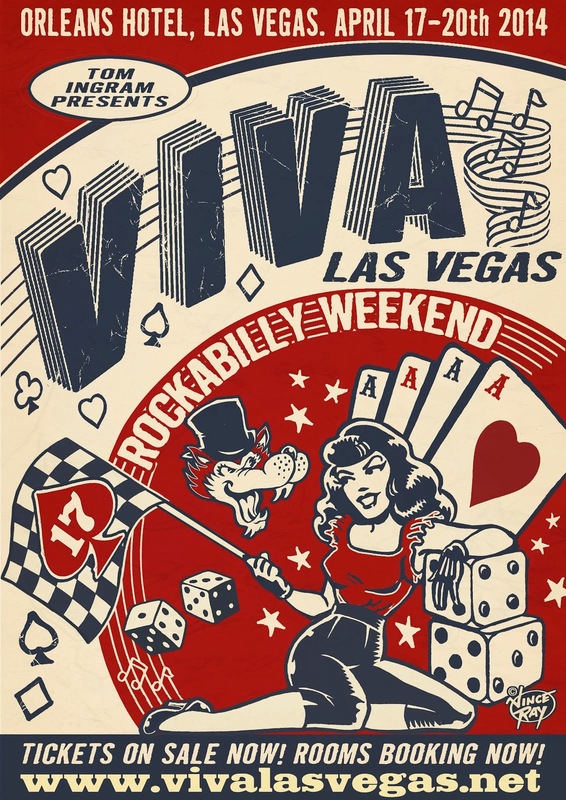 Gaze out at the Downtown Las Vegas skyline as you get served a medley of food and adult beverages. Back at the floor-level pool, Card Dealer Steve will stack up the cards on the outskirts of the pool area, to serve your gambling needs while poolside. Lifeguards and pool area waiters will take care of any incidentals, so relax. Swim through two waterfalls, or into the ground floor pool's grotto, where you can be as close as one could get to the sharks through their tank. Joe - a bartender at the MGM - was found with her group of friends from Carlsbad, CA., and they had a little six-year-old tyke with them who was amused in the pool. 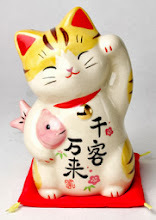 A double-date had come from San Francisco for the weekend, and another group was here with a cousin celebrating his fortieth birthday. 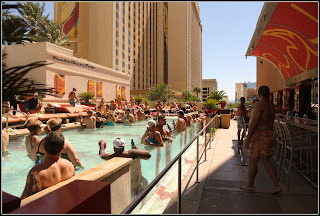 H20 is a traditional relaxing pool area with excellent security and service. 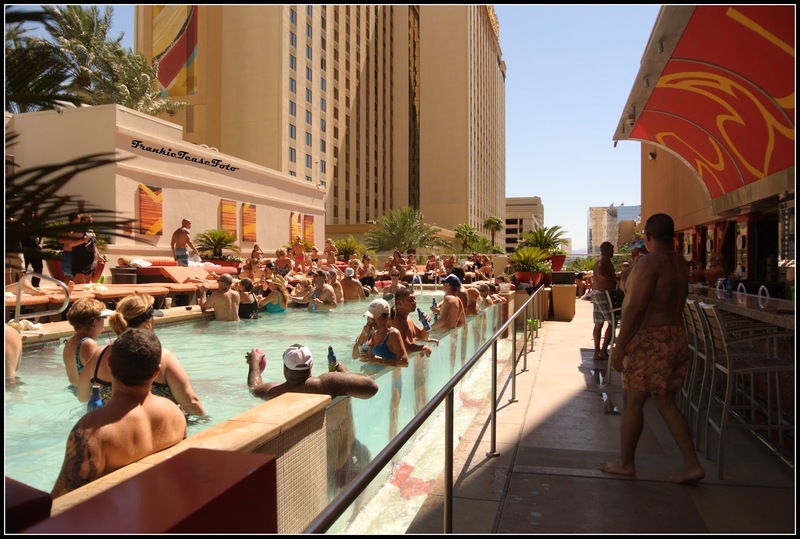 It is top-notch and a favorite for those looking for an amazing experience with proximity to the ever-entertaining Fremont Street and Arts District nearby in Downtown Las Vegas. You won't find any wasted people at this pool, there are plenty of security at the door to stop that, and a room key is required to enter the pool area for each person in attendance. Admittance to the ground level and second-teir sunbathing area is free with your hotel stay. Lounge and TV areas are also available with several bars. The Hideout on the third floor has a day-bed entrance fee and cabana and other bottle-service packages available, including food and other refreshments. 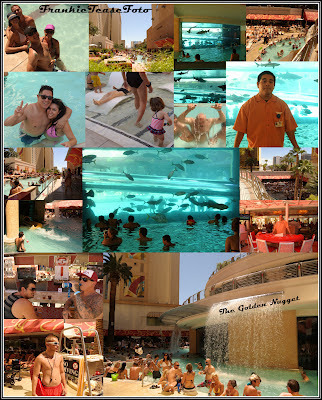 One thing is certain: whatever floor you choose you will enjoy your stay at the Nugget's H20 pool. Hey, even the locals love it. Don't forget to see the 40 lb. golden nugget in the hotel lobby area. It's worth it. 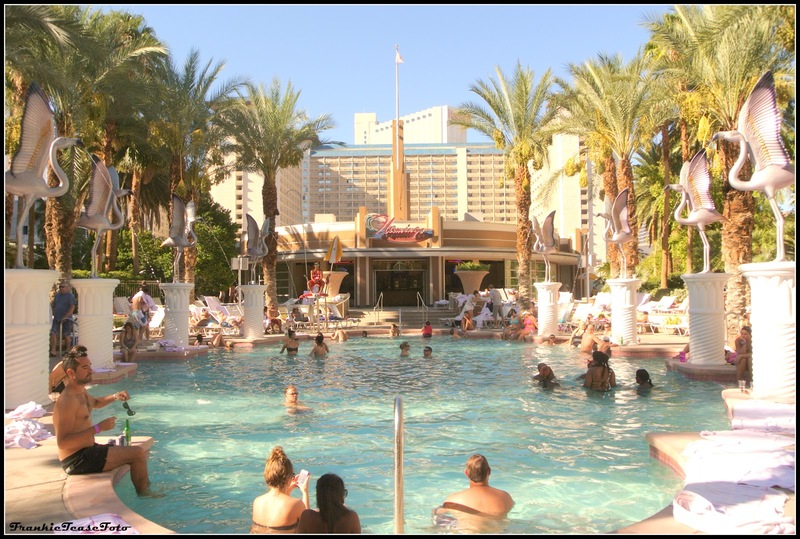 The Flamingo Hotel and Casino Pool is of note and of large expanse on the famous Las Vegas Strip, offering three pools over many acres. The third-oldest hotel still in operation in Vegas, it was originally established by famous mobster Bugsy Siegull (1946). Many of its original feature designs are still in play today, including the neon sign (designed by Betty Willis). The pool on the main lounge is all about the party with a DJ spinning tunes, and cabanas with private bachelorette parties in progress. A wristband is issued after you show your room key at the entrance, but no extra fee is charged. You can escape the sun and noise by ducking into the cavernous grotto lagoon area for a massage (though still outdoors), or visit the sundry store complete with hipster Fedora hats and other pool accessories. Coolers and buckets are available for your adult drink choices as well as nibbles. The huts full of card tables are close enough to play a hand of Twenty-one, while keeping an eye on your party. Escape to the overhead passage way through trees to get back to the all-family area, with three toddler-size water slides for the kids to enjoy. 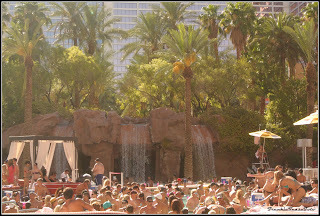 Or, near to it, check out the art-decco style pool - its own escape - at the Flamingo property. A secluded and quieter area, you can enjoy flamingo statues pouring water back into the pool, a feature that must be carried over from the original design. Whether you intend to celebrate and woop it up, or simply enjoy the Vegas weather, there is an area to keep you happy for as long as you want at the luxuriously spread-out and entertaining Flamingo pool. 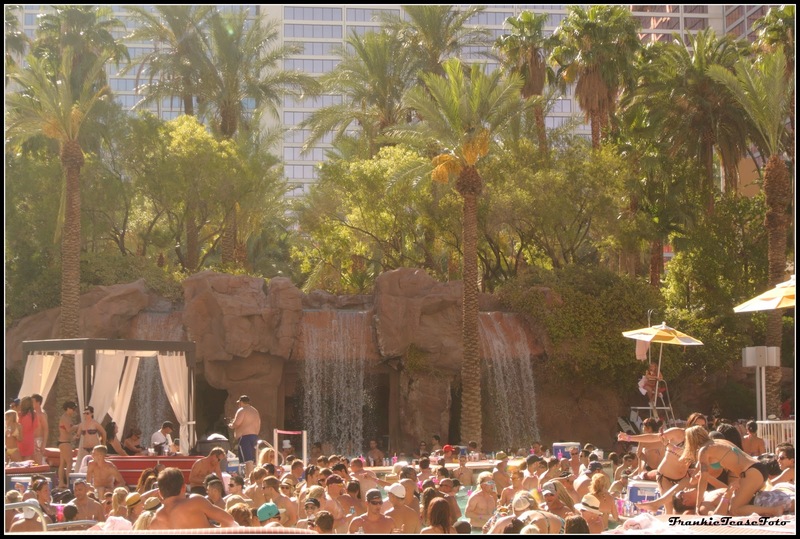 Asia of California shared "We always come to the Flamingo for Labor Day. 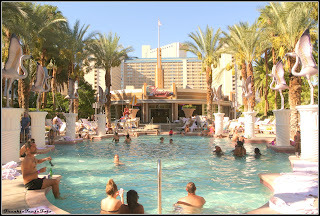 The pool is awesome and our friend's Mom has been gambling here for years". While Flamingo Bartender Arianna was staying busy at the front area, Hannah Rhodes and Jessica Jenson were busy attending to the towel service for their summer jobs. 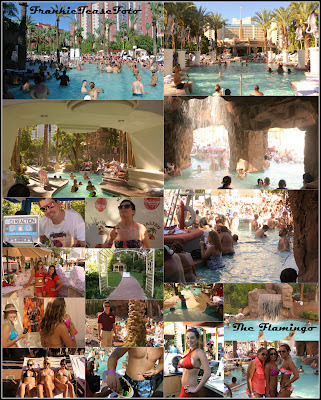 Catch the Flamingo pool on your next trip to Vegas, where there are layers of fun waiting to be had.